There were eyes painted on the church door, narrow red eyes, and ugly stone demons the height of a man stood on either side of the entrance, their teeth bared like savage dogs. "Welcome to the devil's house!" said the bearded man with a mocking bow before opening the heavy door. 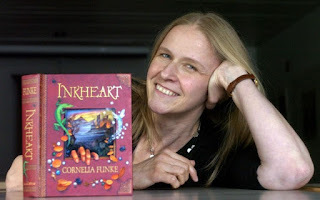 Inkheart (Original: Tintenherz) is a German fantasy novel by Cornelia Funke, translated into English by Anthea Bell. It is the first book in the Inkworld Trilogy. If you have ever read a book and wished that the characters would just come alive, this story is for you! Summary: Meggie is a little girl who loves reading books. She lives with her father, Mo, a book binder! One night, a mysterious stranger named Dustfinger shows up at their house. He calls her father Silvertongue and wants to warn him about some danger. It is the first time that Meggie notices her father lie to her and hide something from her. It is a battered, old book with a green cover; Inkheart. This is where and why the adventure begins. Meggie learns soon, that the reason why her father won't aloud to her, is because he can bring characters out of a book alive. Nine years before, Mo read out the characters of the book Inkheart - a terrible villain Capricorn and his men and Dustfinger, the fire-eater. That same night, Meggie's mother disappeared into the book. Ever since then, Mo tried to keep his daughter safe from those very horrible characters, whom he himself gave life to. And now, he has to face them. My thoughts: I thought it started out as a wonderful concept. The characters, though slightly pretentious about reading, are amazing and so is the setting. My only problem is the plot - there isn't much of it. It seems like the introduction to a series, but not quite a book all by itself. There isn't much excitement till the last few chapters, and that is when we really get to know anything at all about the Inkworld. I love the cover design and I love the way the author has quoted famous fantasy authors at the start of each chapter. But it's a magical story and the rest of the stories may make up for this. I want to read it to, in Cornelia Funke's words, "taste the words, savour them on my tongue"! I have seen the movie and it's not really good. No idea about the book though!